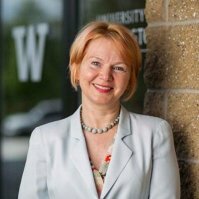 Webster University President Elizabeth (Beth) J. Stroble and Provost, Senior Vice President and Chief Operating Officer Julian Schuster are pleased to announce that Ana Karaman, Ph.D., has been named vice president and chief financial officer (CFO) of the University, effective Sept. 12, 2016. Karaman comes to Webster University after serving as the vice chancellor for Administration, Planning and Finance at the University of Washington Bothell. She has more than eight years of experience overseeing university finances, planning, and administration at various institutions. In addition to her administrative roles, she continues a successful academic career as a faculty member in political science, international relations, comparative law, and political economy. Karaman immigrated to the United States in 1995 from Russia, where she worked as a prosecutor and economist. At Webster University Karaman will lead the Office of Finance and Administration, and be responsible for oversight of financial policy while providing direction for long-term budgetary planning, cost management and investment opportunities in alignment with Webster University’s strategic plan, Global Impact for the Next Century. This position is part of the University’s senior leadership team and Provost’s Council, among other leadership positions. In her position at the University of Washington Bothell, Karaman managed more than $90 million in the university’s annual budget and she developed strategic long-range financial plans for the campus. Karaman also directed facilities planning, campus safety, human resources, risk management, emergency planning and auxiliary services. Before taking on her role at the University of Washington Bothell, Karaman served as the Vice Provost for Institutional Planning, Budget and Effectiveness and tenured professor of political science at the University of San Francisco for three years. Before the University of San Francisco, she was the Associate Vice President for Business and Financial Affairs at Samford University in Birmingham, Alabama. She began her seven-year tenure at Samford as an assistant professor of political science and subsequently moved into administrative roles of increasing responsibility, including director of Institutional Research and director of Special Projects. As a faculty member, she served as a program director of International Studies and was a founding faculty member of the Sigma Iota Rho Chapter-Honor Society for International Studies. Karaman holds a Ph.D. in political science from the University of Wisconsin-Milwaukee, where she also earned a master of science degree in criminal justice. She also taught at the University of Wisconsin-Milwaukee for three years. She has served two National Science Foundation Fellowships; the first at Harvard University and the second at Princeton University. She also graduated with a degree in jurisprudence from the Far-Eastern State University in Vladivostok, Russia.